Using this Coupon, you can now gain free admission to the Jacksonville Zoo if you are a Military Veteran from November 10th to November 11th. 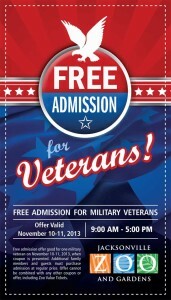 The free admission offer is good for one military veteran on those dates listed and the coupon must be presented. However, please understand that this coupon is only good for the single military individual who uses the coupon, it does not apply towards their entire friends or family group. 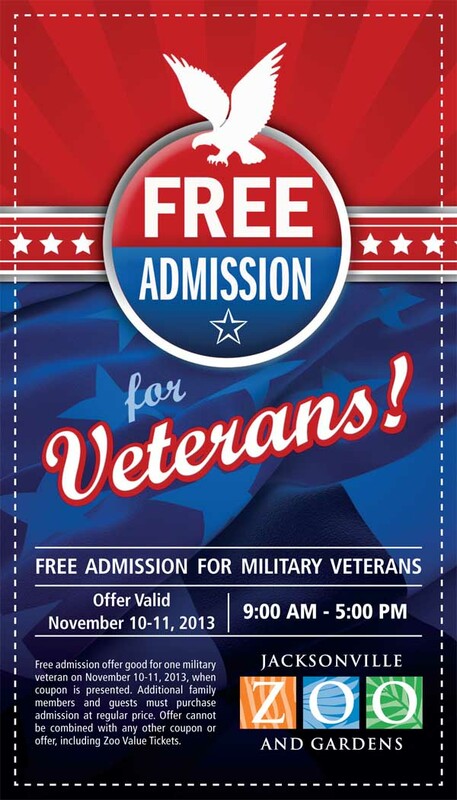 Everyone else (unless they too are military veterans) must pay for admission. And like usual, the offer can not be combined and that includes the Zoo Value Tickets. If you live in Florida. you know that the Jacksonville Zoo is one not to be missed, their mild winters allow them to easily house some of the most remarkable animals you can imagine. As a family event, the Zoo is one of those places you’ll never get tired of visiting. Besides, it’s a great sign of community and patriotism for a Zoo like the Jacksonville Zoo to offer free admission to American Military Vets. Many men who have served are family men and by offering this simple free admission to this family friendly outing, it’s a sign of supporting the community and those who fight to protect it. So head over to the zoo for free and enjoy the day out with your sons and daughters, you freedom fighters!